Once a swaggering Sith lord, Darth Vader and a handful of his loyal Storm Troopers have fallen a far, far way since things blew up on the Death Star. In fact, now they're relegated to schlepping luggage around at the airport. OK, it wasn't actually Darth Vader, or even Dark Helmet, since they're fictional characters. But a group of volunteers dressed up in Star Wars garb wished travelers a happy May 4th, or as it has now been christened, “Star Wars Day," at Denver International Airport yesterday. The marketing ploy made for some great images. Take a look. Here the Storm Troopers patiently wait for their lord to arrive. The evil group made sure to check their flight statuses. Hopefully it wasn't delayed, or some innocent airport employee might've gotten Jedi-choked out. 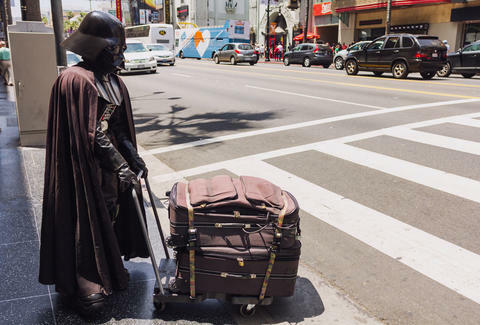 Vader then made an appearance at baggage claim. He obviously had to check his lightsaber. Storm Troopers inspected the plane before take off. Given their previous failure to notice the Death Star's major flaw, well, let's assume someone more competent also did the job. Was it a cool stunt? That depends on how you define cool. But if you're looking for something more fun than the usual trip to the airport -- well, May 4th seems like a good time for you to fly.